Ideas about racial and cultural identity, even among indigenous people, have changed significantly over time. One such person is Joseph Louis Cook, the son of an African-American father and an Abenaki mother who had both been taken captive by the Iroquois. Cook himself was raised in the Mohawk community and played a prominent role fighting on behalf of the Continental Army during the American Revolution. 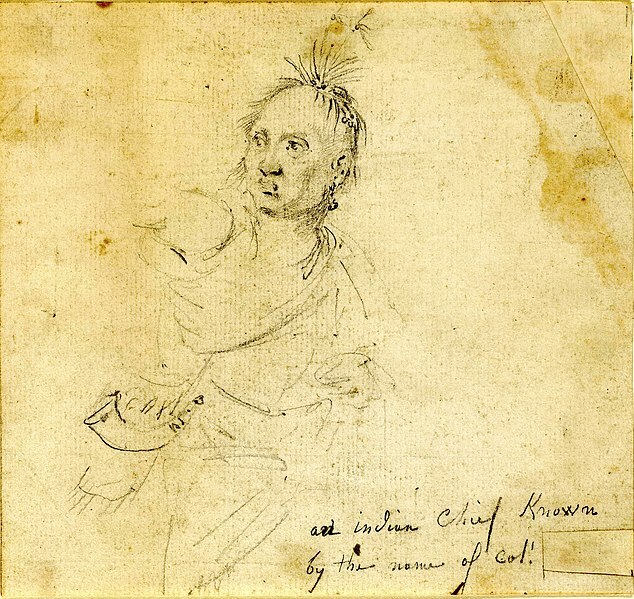 The Mohawk are a matrilineal people (they trace their kinship and identity through their mothers), and so Cook would have likely identified himself as a member of the Iroqouis confederacy; he married a Mohawk woman and served as a diplomatic chief of the Oneida. 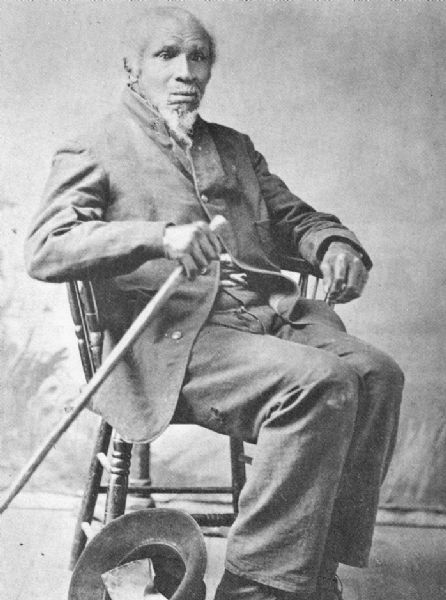 Another individual was Pierre Bonga, whose parents had been enslaved and then freed by a British officer on Mackinack Island in Michigan. Pierre went on to work in the fur trade in what became Minnesota and married an Ojibwe woman; at least one of their children, George, also worked in the fur trade and is known as the first African-American born in Minnesota. Unlike the Mohawk, the Ojibwe are patrilineal, tracing their tribal identity through their fathers, so it seems likely that George would have thought of himself as African-American rather than Ojibwe. Another prominent person in this time period was Crispus Attucks, the first person killed in the Boston Massacre. 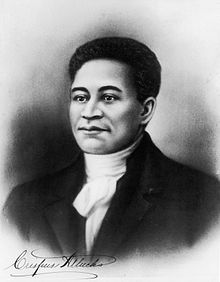 His father had been enslaved and his mother was a Natick Indian; Attucks himself was a slave who escaped and became very active in the Revolutionary movement in Boston. Whereas the men mentioned above were probably born free, Attucks was likely born a slave and that status may have influenced his identification as an African-American. Certainly he is remembered as one of our African-American heros of the American Revolution, and his Native ancestry is underemphasized. The reference you make to the individual’s literacy reminds me of Frederick Douglass’s experience as a slave in Baltimore, where his master’s wife taught him to read and write. Douglass remarked that American slaves thought themselves the most forsaken of God’s children, until they met the American Indian. The history of African-Native interactions in North America goes back to the 1526 expedition of Lucas Vasquez de Allyon, a Spanish soldier who established a colony at the mouth of the Peedee River in South Carolina. Four months later, Allyon died and the colony fell apart; the 100 enslaved Africans that Allyon brought with him were free to join local Native communities. When we consider this long history, then—one that dates back to the very invasion of the Americas—we have to recognize that ideas about racial and cultural identity have changed significantly over time. As i indicated above, these men that we remember as African-American today may not have thought of themselves that way. Native peoples were in power long enough through the 18th century to exert considerable influence over how their communities functioned and how they determined belonging. So even though Frederick Douglass’s estimation of Native-African relations may have rung true in the nineteenth century (after Native nations had been removed from the Southeast and their lands taken from them in Northeast), it was unlikely that all Native people thought their Creator had forsaken them in the 18th century. Similarly, African-American literature flourished in the 18th century, as freed slaves wrote their life histories. Dozens of these tracts have survived, emerging from a time in our history when whites did not universally see slave literacy as a threat to the social order. I suspect if the story you seek exists in one person, it is to be found in this body of slave narratives. Not coincidentally, the Removal and dispossession of Indians occurred around the same time as increased repression of African-Americans, both free and enslaved, in the 1830s. What changed between the relative autonomy enjoyed by Native and African Americans in the 18th century and the oppression and dispossession they experienced in the 19th century? The American Revolution. This was an event driven by a desire for freedom from the political authority of Great Britain and a desire to control Indian lands that Britain had largely prevented American colonists from settling. Despite these twin aims, men like Joseph Louis Cook (later known as Colonel Louis) fought for the Americans for their own strategic reasons—not to advance American interests, but to advance what he perceived as Iroquois interests. The ideal of freedom promoted by the Founding Fathers did not extend to anyone but free white males, but of course men like Crispus Attucks and many others fought to be included in this vision. It was a tough road and remained so—after the colonists finally eliminated the British presence in the War of 1812, African Americans and Native Americans were left to deal with a regime that had no interest in their freedom or their preservation as autonomous people. The slave-led Haitian Revolution and slave revolts in the new United States drove various states, particularly in the South, to crack down on what freedoms enslaved people enjoyed, while at the same time conspiring with the federal government to dispossess Indians of their lands through Removal. The United States only exercised a vague authority over places like Minnesota and Michigan (then known as the Northwest Territory), where the Bonga family settled. It’s possible that the individual you seek indeed settled in one of these loosely-controlled areas after learning that the opportunity he sought was not available in the states. For example, even though he fought with the Americans and presumably should have found a home in the United States, Cook actually went to Canada with a group of Mohawks after the Revolutionary War. Originally published by Teaching History under the terms of a Creative Commons Attribution Non-Commercial Share Alike 3.0 license. 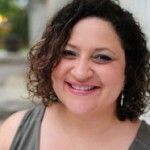 This entry was posted in Uncategorized and tagged African American, History, Native American. Bookmark the permalink.